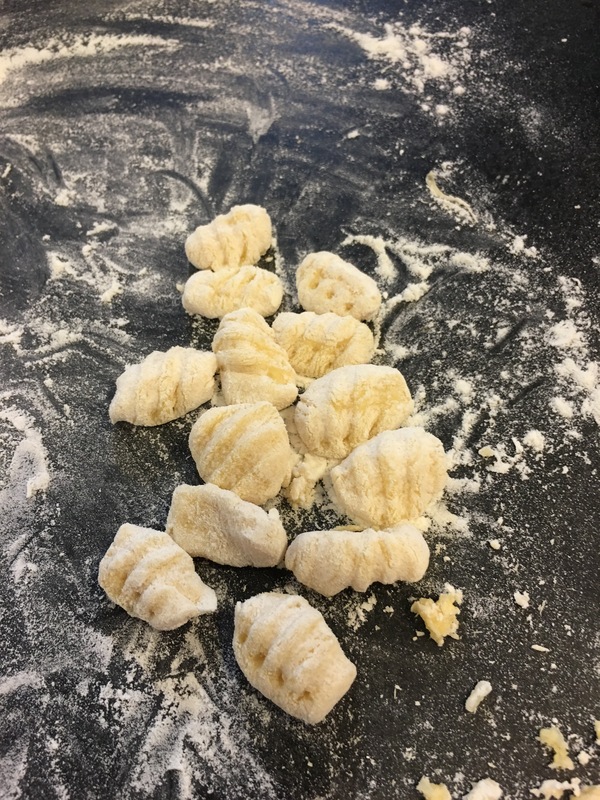 Gnocchi, taught to me while in Italia! – Hurried Home Chef! 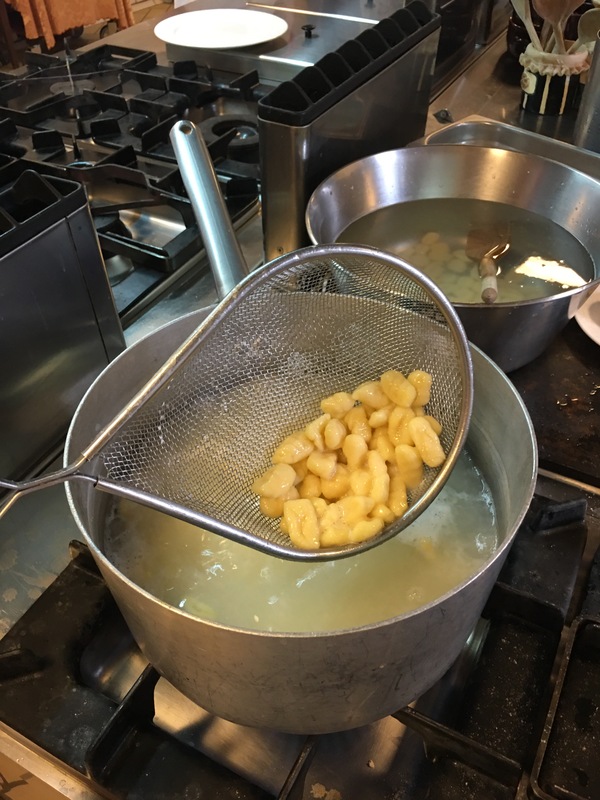 Gnocchi, taught to me while in Italia! I was lucky enough to make it to Italy in my lifetime, and once there, I had to learn some basics! 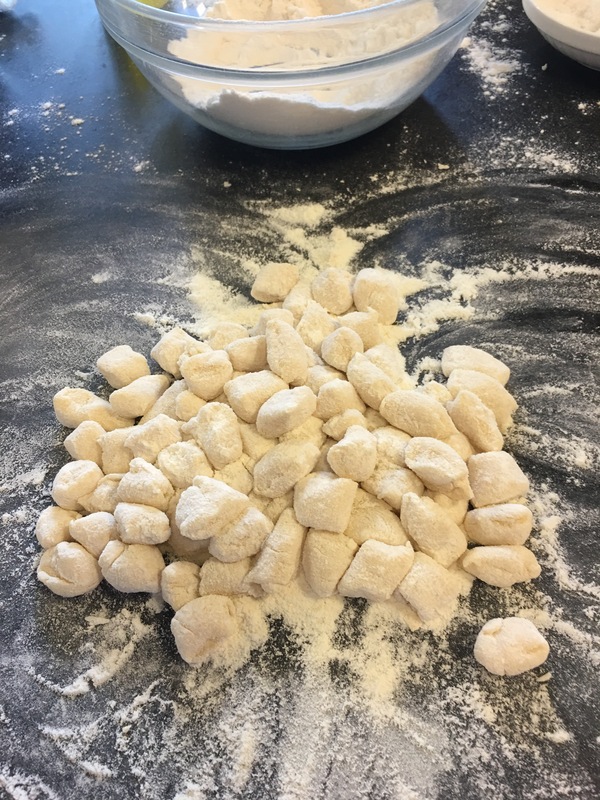 Gnocchi is a potato dumpling that is a soft, pillowy, vessel for sauce! 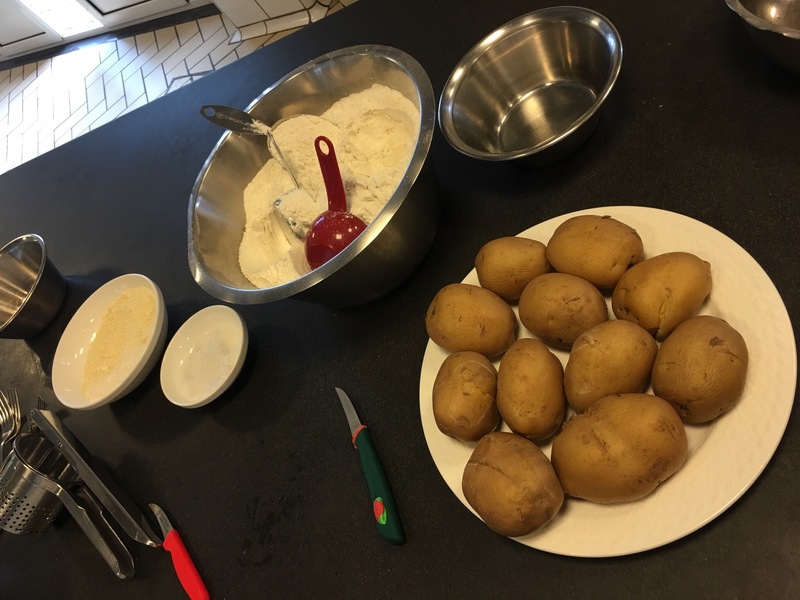 First we start with a low density potato, avoid Idaho, a nice mellow thin skinned potato works best here. 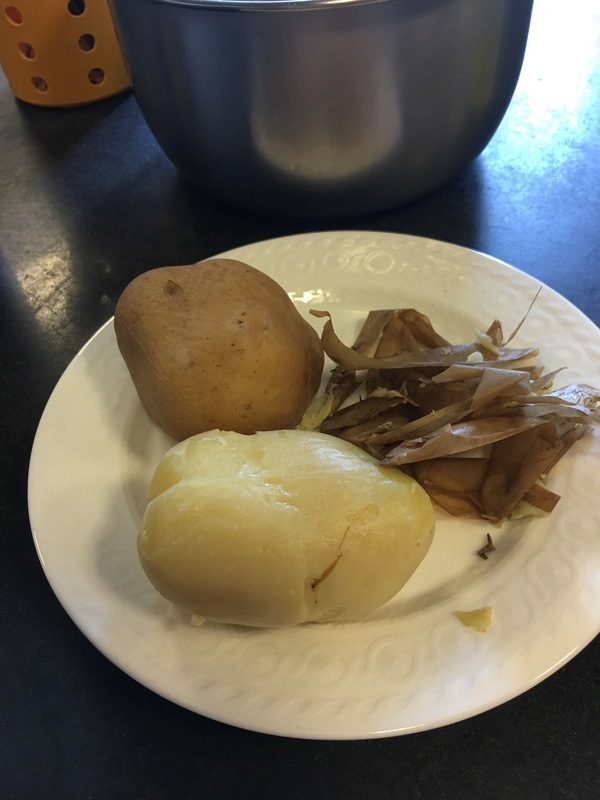 Boil and cool to about room temperature. 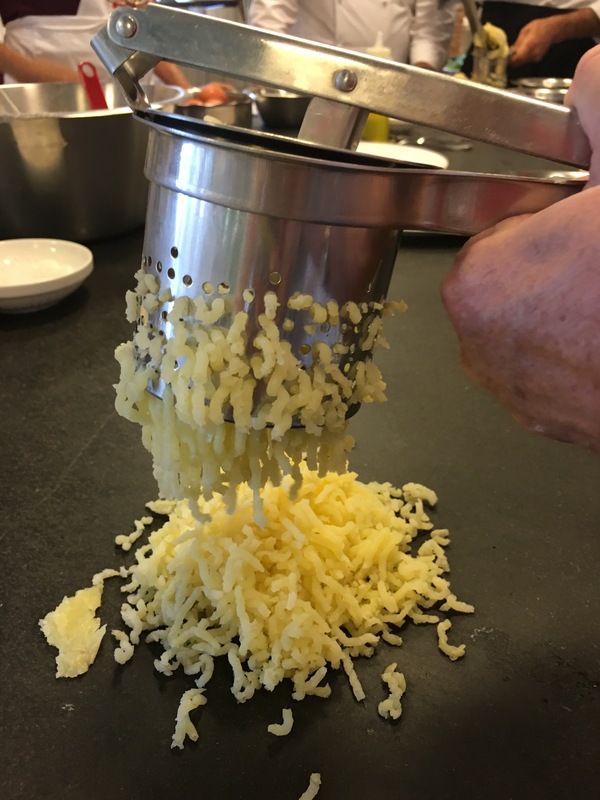 This is a potato ricer and it is the best way to get the best consistency. You can mash with a fork if you don’t feel like dealing with this step. 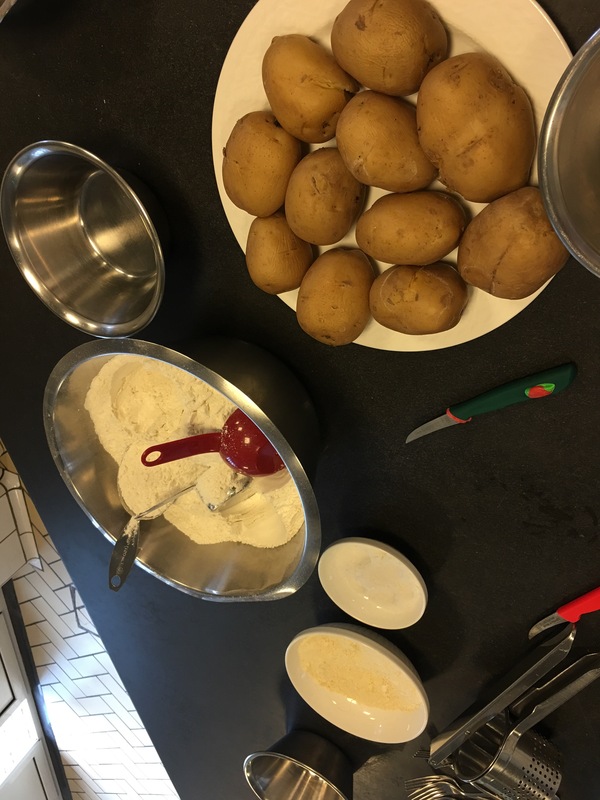 One medium potato is enough for one serving, so if making for 2 people, use 2-3, and you’ll have lunch for the next day. 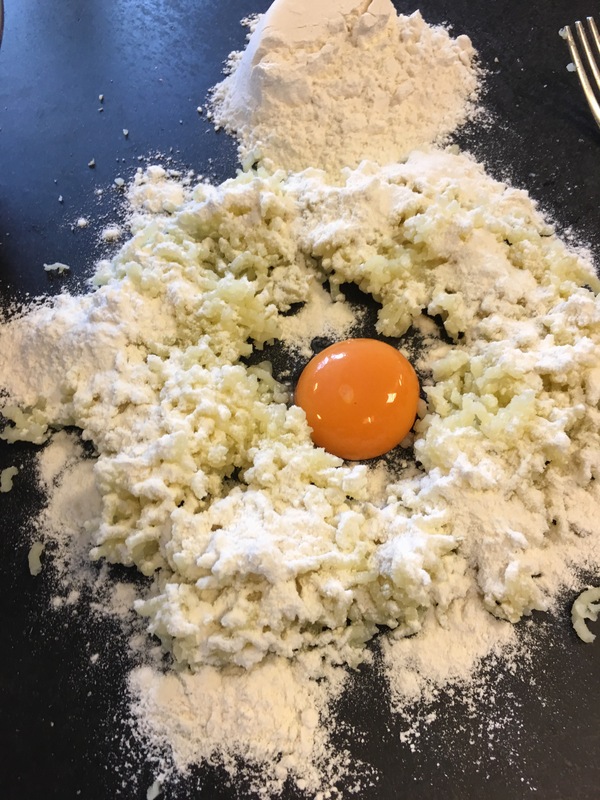 Make a well and add about 1/2 cup of flour and one egg yolk per serving. 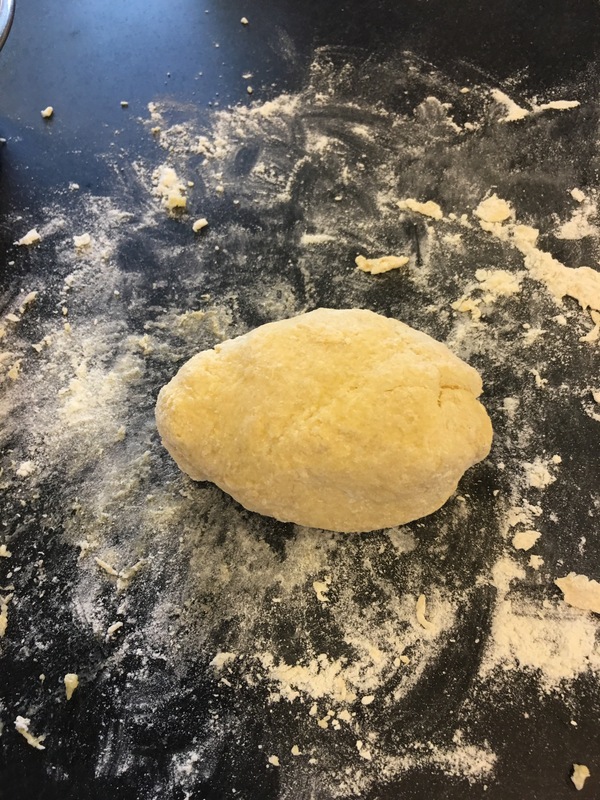 We used a pasta flour (00) but regular AP or semolina will work too. Form together so it is firm enough to roll and not fall apart. 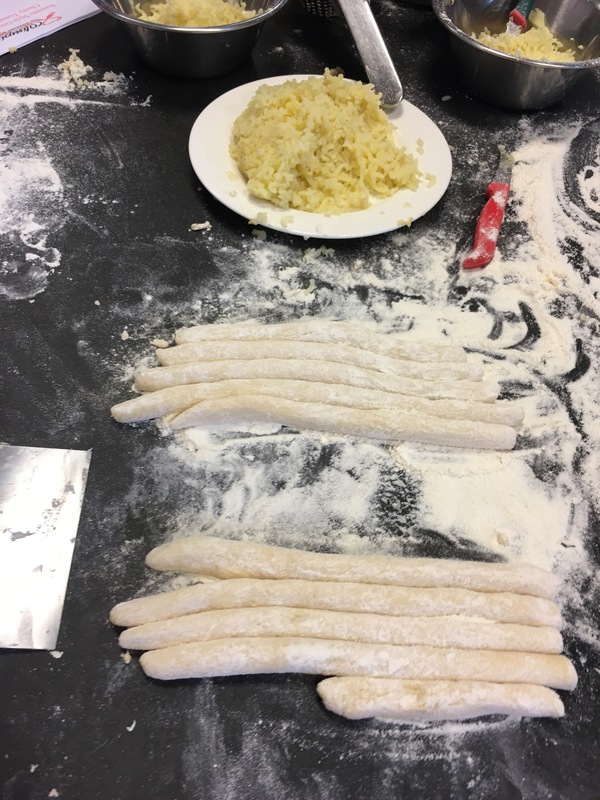 Make several long skinny rolls that are all about the same size. Cut with a knife or scraper, keep the size the same so it will cook evenly. 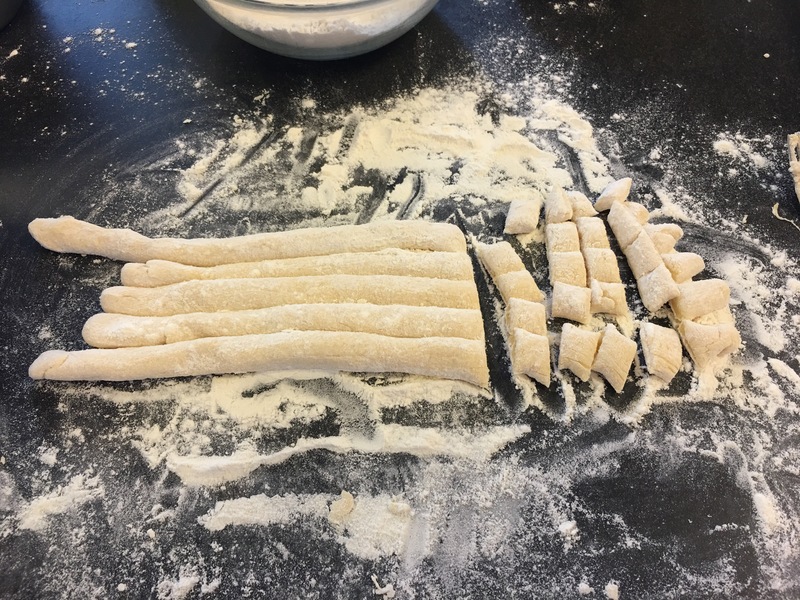 You will need to use a lot of flour to keep it from sticking together. You can cook them now or use a fork and roll each one on the back of it to get the divets. These serve only for sauce holding and visual appeal! Sift the flour off and boil. The water should be a gentle boil but not too high. Once they float to the top, they are done. Strain and place in dish. You can add your sauce and eat now, or do this early and bake right before dinner. 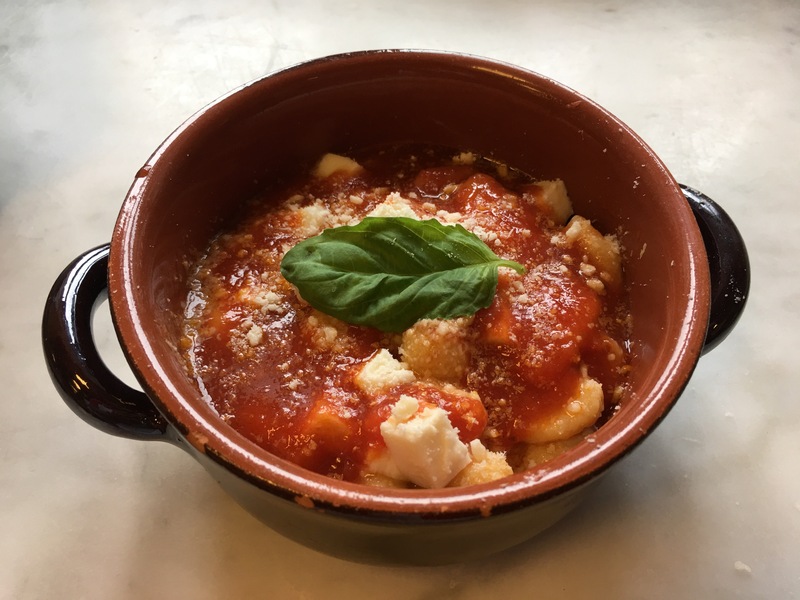 Here it was topped with marinara, a few cubes of fresh mozzarella, and good quality grated parmigiana. Bake at about 350 to melt cheese and serve, top with basil just before serving. This looks soooo good Stacie!